Resistant starch is simply starch that passes through the small intestine without being digested. Thus, the starches are resistant to digestion. Instead, the fibers pass through to the large intestine where they ferment and feed your healthy gut bacteria. Resistant starches are sometimes man-made and sometimes naturally present in food. Cooking and preparation methods can affect the amount of resistant starch in your food. Research suggests that there are benefits to consuming these starches as a regular part of your diet. Most of the carbohydrate we consume is starch and the starch that we eat is digested at different rates. For example, the starch in potatoes, cereals, and baked goods digests very rapidly. Yet other starchy foods, such as beans, barley, or long grained brown rice are digested more slowly and cause a much slower and lower blood sugar rise. Resistant starch actually goes all the way through the small intestine without being digested at all. In this way, it is more like soluble fiber. In some cases, resistant starch is classified and labeled as fiber. There are four types of resistant starch. A single food may contain more than one type of resistant starch. Type 1: This stretch is difficult for the digestive process to reach, often due to a fibrous "shell." Grains and legumes which are cooked intact are an example. Also, some altered starches, such as Hi-Maize corn starch, are in both this category and the next. Type 2: Some foods, such as unripe bananas, raw potatoes, and plantains, have a type of starch which our digestive enzymes can't break down. Type 3: Small amounts of resistant starch (about 5 percent of the total) are produced when some starchy cooked foods, such as potatoes and rice, are allowed to cool before eating. Type 4: Manufactured resistant starch is made by various chemical processes. Different types of resistant starch may provide different effects and health benefits in the body. For example, some evidence suggests that type 2 resistant starch may have a greater impact on glucose control than type 4 resistant starch. The type of resistant starch you choose, as well as the preparation method, can affect the health benefit you gain from consumption. There are calories in resistant starch, but not in the way you would think and less than regular starch. When resistant starch reaches the colon, it is used for fuel by the bacteria there. This process, called fermentation, produces a certain type of fat called short-chain fatty acids (SCFAs). It is these fatty acids which produce most of the calories from resistant starch along with many of the benefits. SCFAs are also produced by soluble fiber and oligosaccharides. This is the reason why on certain food labels, some fiber is shown as having calories associated with it. But these calories do not raise blood glucose. As resistant starches are increasingly studied, researchers continue to find health benefits associated with their consumption. Many of the health benefits of resistant starch are also common to oligosaccharides and fermentable fiber. Resistant starch is especially associated with one type of SCFA called butyrate. According to research studies, butyrate is protective of colon cells and associated with less genetic damage which can lead to cancer. Butyrate also protects the cells in other ways. This is one of the real strengths of resistant starch over oligosaccharides and soluble fiber. Their fermentation does produce butyrate, but not at the levels of resistant starch. As with other fermentable fiber, resistant starch is associated with more mineral absorption, especially calcium and other minerals. In fact, animal studies have shown that consumption of resistant starch could have a positive effect on intestinal calcium and iron absorption. Many believe that this benefit carries over to humans. Perhaps most exciting for people with sugar issues, resistant starch seems to improve insulin sensitivity, according to published research. In the so-called "second meal effect," fermentable fiber and resistant starch are associated with improved glucose tolerance either at the following meal or the next day. There is evidence that this is caused by the presence of the short chain fatty acids and by a peptide produced in the fermentation process. Resistant starch produces more satiety, possibly partly through the release of a different peptide (PYY). Researchers have investigated the effects of resistant starch in both normal weight and obese subjects. Published studies have demonstrated that it can boost satiety and decrease both appetite and food intake. Researchers continue to investigate the benefits of resistant starch with positive outcomes. Its consumption is associated with lower cholesterol and triglyceride levels, may promote bowel regularity, promotes "good" bacteria, and suppresses "bad" bacteria in the gut. Lastly, researchers are investigating whether or not resistant starch in a meal is associated with less fat storage after that meal. There are many different types of food that you might add to your diet to increase your intake of resistant starch. 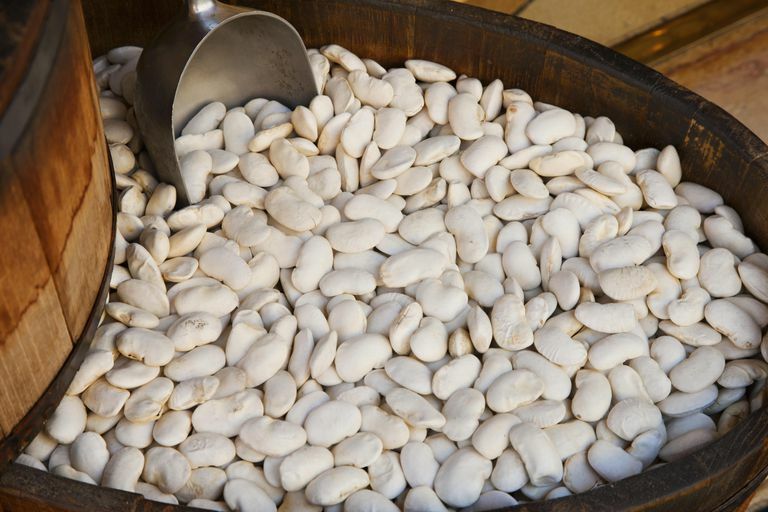 Different types of beans (and preparation methods) yield varying amounts of resistant starch. In general, however, the starch in beans is about evenly divided between slowly digested starch and resistant starch. Note, though, that products such as Beano, which increases the digestibility of beans, will also decrease the amount of resistant starch. Whole, intact grains are sources of resistant starch, as are other popular starchy foods such as rice and potatoes. Most of us prefer to eat bananas when they are ripe and sweet. Unfortunately, when bananas ripen, they lose their resistant starch. Similarly, if you cook bananas they lose resistant starch. Instead, buy your bananas when they are green and consume raw within two to three days. Plantains are also a good source of resistant starch. Some people use potato starch as a supplement to increase their resistant starch intake. The white flour-like powder can be added to smoothies or other dishes, as long as you don't cook it. The starch in shirataki noodles is classified as soluble fiber, but it seems fairly close to resistant starch in composition. Hi-Maize corn starch also provides resistant starch. It can be used to substitute for part of the flour in baked goods. It produces a slightly lighter texture. Health experts recommend that you gradually increase your intake of resistant starch; don't start your program by consuming a large number of foods from the list above. Instead, add one of two foods over several days and see how your body adjusts. Some people report gastrointestinal problems (such as gas and bloating) when they add resistant starch or fiber to their diet. Also, drinking more water will help reduce any discomfort experienced as you adjust to the new foods. Brighenti, Furio et al. " Colonic fermentation of indigestible carbohydrates contributes to the second-meal effect." American Journal of Clinical Nutrition 83.4 (2006): 817-822. Cummings, JH. "The Large Intestine in Nutrition and Disease: (monograph), December 1996, ISBN 2-930151-02-1. Englyst, Klaus and Englyst, Hans. "Carbohydrate Bioavailability." British Journal of Nutrition 94 (2005): 1-11. Englyst, Klaus, et al. "Glycaemic index of cereal products explained by their content of rapidly and slowly available glucose." British Journal of Nutrition. 89 (2003):329-339.